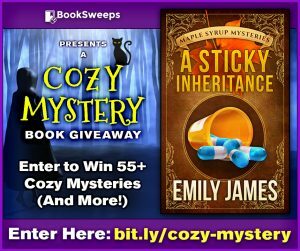 The next book in my Maple Syrup Mysteries is coming out on April 1st, but while you wait, why not check out some new authors. A group of mystery, thriller, and suspense authors are offering books for free to readers. You can grab your copies here! Filed Under: Read This First! Welcome to my website. Let me give you a quick tour. Right now, you’re at my blog. I have plenty of things I’m excited to share with you in the future. Because my current mystery series is set on a maple syrup farm, I’ll be posting fun facts about maple syrup. I also want you to get to know me a little more though, so I’ll also be posting things I think you might be interested in about me, like my “painting of the week” where you can see what I’ve been working on. (I’m a new artist. Be gentle.) And, of course, when I have book news, it’ll appear here too. If you’re looking for information about who I am and what types of books I write, the best place to look is my About Emily page. I’ve included some of the expected biographical info, but I’ve also created a list of frequently asked questions. I’ll be adding to that list over time as more questions filter in. So there you have it–my website in a nutshell. If you stumbled upon it by accident, I hope you’ll stay awhile. If you found it because you’re already a reader of my books, thank you! If you’re interested in connecting with me more, I also have a Facebook page.